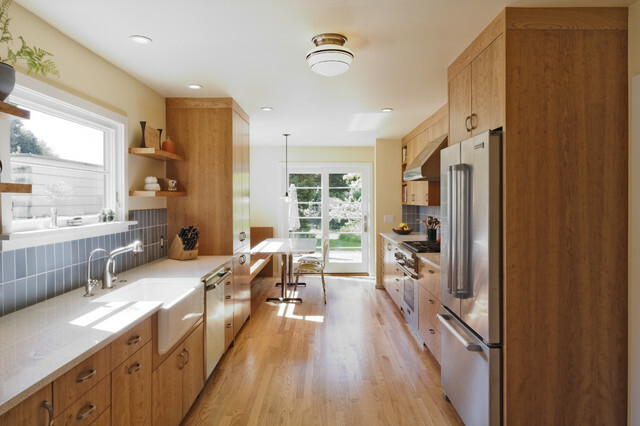 Designed for a 1930s Portland, OR home, this kitchen remodel aims for a clean, timeless sensibility without sacrificing the space to generic modernism. Cherry cabinets, Ice Stone countertops and Heath tile add texture and variation in an otherwise sleek, pared down design. A custom built-in bench works well for eat-in breakfasts. Period reproduction lighting, Deco pulls, and a custom formica table root the kitchen to the origins of the home.